Greater part of the Estonian public is waiting anxiously for the Academy Award ceremony, taking place in Los Angeles on Sunday. It’s the first time that the country of 1.3 million has managed to get one of its films nominated for an Oscar. The Estonian-Georgian movie, “Tangerines” (“Mandariinid” in Estonian), was nominated for an Oscar in the Best Foreign Language Film category for the 87th Academy Awards in January and has since then sparked a widespread excitement in the country. Media outlets set up dedicated sections, and cinemas and TV-channels screened the film, originally released in 2013, again. One channel also bought rights to transmit the award ceremony live, an unusual feat, considering the cost. Many people are also planning to gather at homes with their friends and stay up all night watching the live broadcast, despite having to work next day. “Tangerines” has become the most successful film involving Estonian filmmakers, notching up tens of international awards since 2013. The film is a haunting tale of an older Estonian man who cares for two wounded soldiers from opposite sides of the 1990s-era war in Georgia. The true part of the story is that there were indeed Estonian villages in the area. However, once the war started, most of the Estonians who had settled there, returned to their homeland. “Tangerines” was directed and written by the Georgian director, Zaza Urushadze and an Estonian film producer Ivo Felt. The leading roles are played by Estonian actors Lembit Ulfsak and Elmo Nüganen, and Georgian actors Giorgi Nakhashidze and Mihhail Meskhi. The filming took place in the Guria region in Georgia and the total cost came to 650,000 euros – a tiny amount by international standards. Estonian World’s film critic Birgit Drenkhan predicted already in 2013 that “Tangerines” had a potential to take Estonian filmmaking to a completely new level. “For me, this film opens a new chapter in the Estonian cinematic history. “Tangerines”, although war is always around, is not a war film. War just helps bring out the most important message (as white looks brighter in front of black). The story is about being human and, no matter what, believing in the human kind. The story is balanced, without being too dramatic or brutally funny. A serious subject is dealt with through subtle humour. The director knows psychology and how to manipulate with the viewer, so he takes us to an emotional rollercoaster by making us both laugh and cry. It is also an artistically beautiful movie with nice nature scenes, impressionistic sunsets and close-ups of an old man’s hands making woodwork,” Drenkhan said. The New Republic, an American liberal magazine, came to the same conclusion recently, calling the film “the anti-American Sniper”, a reference to the biographical war drama film about the US sniper who shot dead 255 insurgents during the last Iraq War. “In ‘Tangerines’, war is about how many people you don’t kill,” the magazine wrote. When the Academy Award announcement came, there was a concern that too few people in the US have seen the movie. The Academy tends to, but not always, award the films that have had an exposure in the US market. Indeed, up until now, “Tangerines” lacked a distributor in America, but this all changed last week, when the motion-picture company Samuel Goldwyn Films acquired the US rights to the film. “Zaza Urushadze has created a beautiful film with remarkable performances from his cast. The writing, directing and acting help balance both the humour and serious tones captured on film. I am very excited to bring this film to a US audience and wish Zaza and his team the best of luck at the Oscars next weekend,” Peter Goldwyn of Samuel Goldwyn Films said, commenting upon the deal. The Estonian-Georgian team behind the film is already in Los Angeles, calming their nerves in Santa Monica. “Unlike at the beginning of the nomination, I now believe that we have a chance to win. Winning the Sattelite Award certainly added more hope,” Ivo Felt, the film’s producer, said to Delfi, an online Estonian news portal. According to film critic Stephen Farber, it is really difficult to predict this year’s win, among the Best Foreign Movie nominees. He concedes that “Leviathan” is a favourite, due to widespread publicity and distribution, but “Tangerines” is really liked by public. “It affects people emotionally,” Farber said to Delfi. Whether local employers need to worry about the productivity of Estonians, following the Academy Award ceremony, remains to be seen – but with the Independence Day taking place on the following day, “Tangerines” win at the Oscars would provide the country a double reason to celebrate. Please note that “Ida” – a Polish drama film directed by Paweł Pawlikowski, won the Oscar in the Best Foreign Language Film category at the 87th Academy Awards. The shorter version of this article was first published on ERR News. 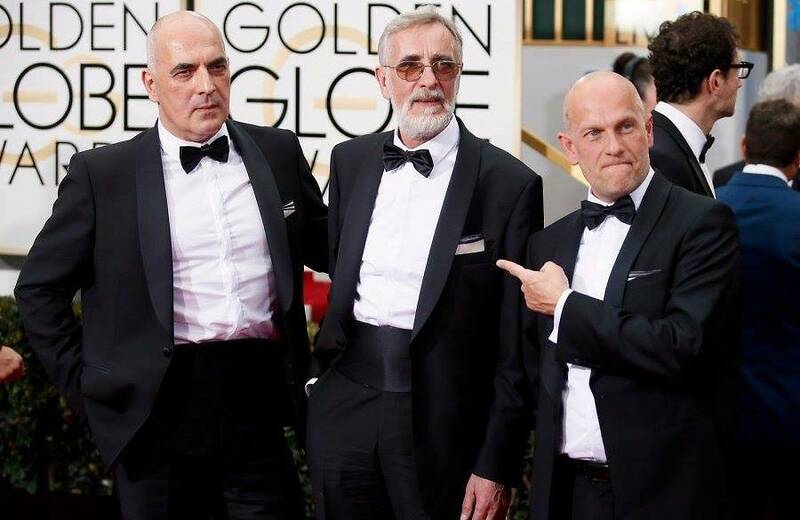 Cover: “Tangerines” director Zaza Urushadze, leading actor Lembit Ulfsak and producer Ivo Felt at the Golden Globe award ceremony in January (Credit: Danny Moloshok/Reuters).